An evaluation for interstitial lung disease (ILD) can present a significant challenge to the general internist as well as the pulmonologist. 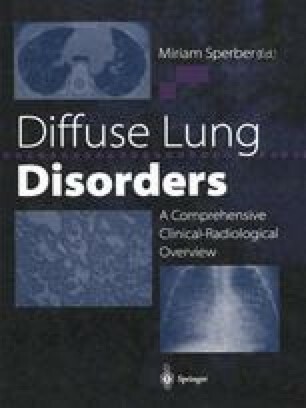 In the absence of infection and neoplasm, ILD is comprised of a heterogenous group of chronic and acute disorders which share several clinical features: (1) exertional dyspnea; (2) bilateral diffuse infiltrates on chest radiograph; (3) physiologic derangement in gas exchange manifest by a decreased DL Co, restrictive lung defect with or without coexisting airflow obstruction, and hypoxemia at rest or with exertion; and (4) histopathologic features of inflammation and fibrosis of the pulmonary parenchyma. The diseases which manifest these findings, however, are extremely varied in their etiology and prognosis (Figure 7.1). Acute hypersensitivity pneumonitis, for example, has an excellent prognosis if the inciting exposure is identified early in the disease process and removed before significant fibrosis develops.